6BASE is pleased to present Meena Hasan and Cal Siegel: wallflower frieze, a two-person exhibition, on view March 4 through April 2, 2017. This is the third exhibition in the space and will include collaborative works made on site by Hasan and Siegel. This is the first time the couple has worked together. 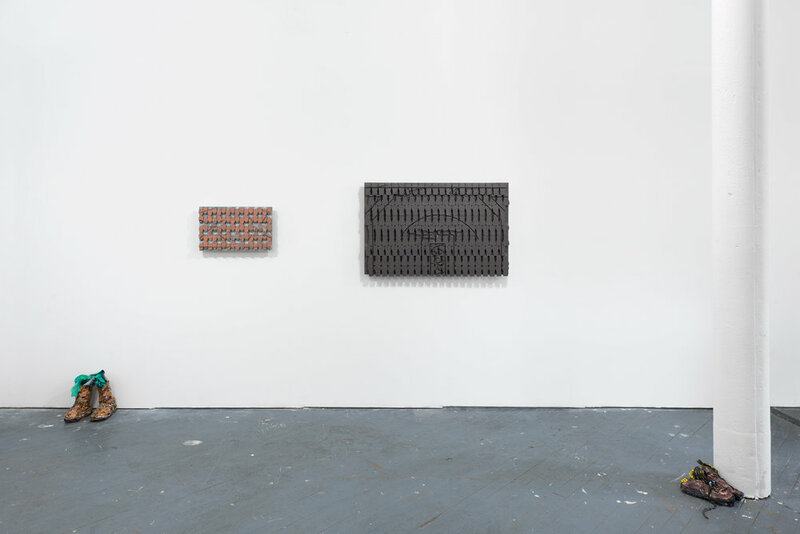 Both Hasan and Siegel’s practices are rooted in repetition of form and explore how things change over time. 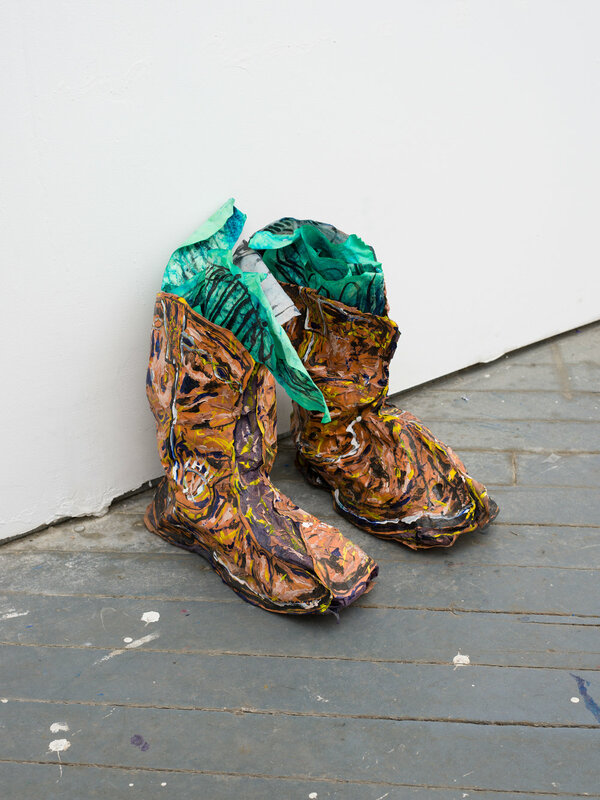 Working from familiar materials such as furniture or clothing items, their works thoughtfully detach objects from their original function and take on different meaning as they interact with the surrounding space. In their collaborative work, titled wallflower frieze, Siegel has created a frieze (large horizontal relief-like structure) out of wood in which uniformly cut wooden bannisters line the top and an arrangement of small-scale shingles cover the entirety of the work. Hasan’s jacket is hooked and attached to the wall beneath the structure. Modeled after one of Siegel’s own jackets of a similar color, Hasan’s work is made of Japanese Okawara paper and takes its form from the applied acrylic and fabric dye. Sitting on top of the structure is a sculpture, made in a similar technique as the jacket, representing Cal’s studio sneakers. The exhibition, which title is drawn from a line in Bob Dylan’s 1966 song “Visions of Johanna,” aims to create space through visual language that represents familiar aspects of domestic environments. Hasan’s paintings explore close-up imagery of habitual actions or, as the artist describes, “everyday rituals of transition.” Her studies capture various points of view, such as getting up off a floor as depicted in her work on Khadi paper Getting Up (2017) or looking down into a palm of a hand as her two small-scale paintings of the same title, Untitled (glove) (2017), illustrate. Brilliantly colored, her paintings demonstrate intricate patterns that often derive from textiles, the first form of artwork Hasan was exposed to as a child. The artist’s use of contrast in color and brushwork exaggerates both the texture of the composition and the moment being depicted. Siegel’s works combine elements of both painting and sculpture. Often mounted on the wall, his compositions are comprised of materials such as small-scale shingles and found wooden bannisters. The artist layers the bannisters and shingles with plaster and acrylic, creating surfaces of pattern that enter into light and recede into dark crevices. These surfaces reference vernacular architecture and follow a loose modular pattern that is often punctuated by routed, drawn line. Four of the artist’s wall-mounted works and a photograph taken by the artist are included in the exhibition. Meena Hasan was born in Manhattan and currently lives and works in Brooklyn. She received her B.A. from Oberlin College, Ohio and her M.F.A. from Yale University School of Art, New Haven, Connecticut. 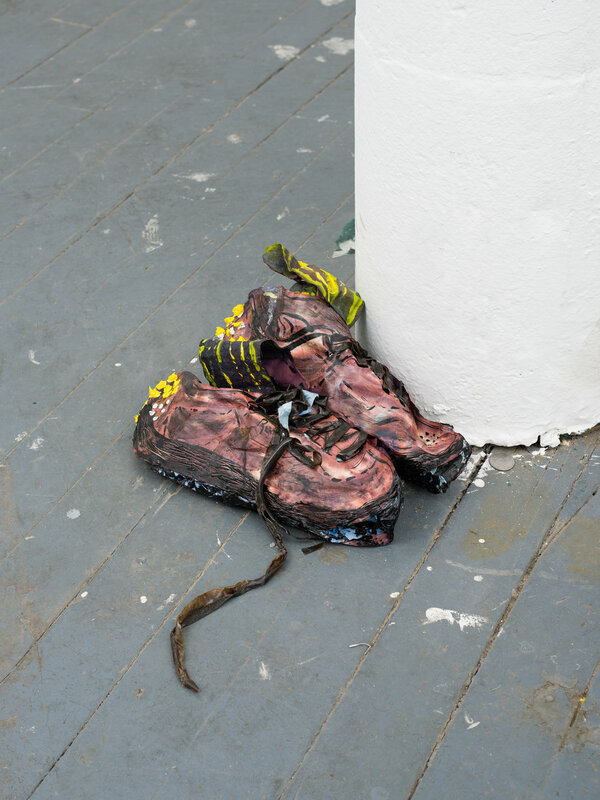 Hasan’s work was the subject of a solo exhibition, Meena Hasan’s New Place, at Violet’s Café, Brooklyn in 2015. She has participated in a number of group exhibitions including Sheherzade’s Gift: Subversive Narratives, Center for Book Arts, New York (traveled to Twelve Gates Arts, Philadelphia); Stages, Zürcher Gallery, New York (all 2016); The landscape changes 30 times, Anahita Gallery, Tehran, Iran; Sheherzade’s Gift, Local Project, Long Island City, New York (both 2015); CURRENT: Gowanus, Gowanus Loft, Brooklyn; and The Last Brucennial, Bruce High Quality Foundation, New York (both 2014); among others. Opening March 24, 2017, Mariboe Gallery, Peddie School, Highstown, New Jersey will present a solo exhibition of the artist’s work. In 2013, Hasan received the Carol Schlosberg Memorial Prize for Painting, Yale University School of Art. As the recipient of the Terna Prize, Hasan was a fellow at the American Academy in Rome; she was awarded third place in the International Premio Terna art competition, which held exhibitions in Rome and Shanghai. Cal Siegel was born in West Newbury, Massachusetts and currently lives and works in Brooklyn. He received his B.A. in Studio Art and Media Studies from Pitzer College, Claremont, California. In 2015, he attended Skowhegan School of Painting and Sculpture in Maine. 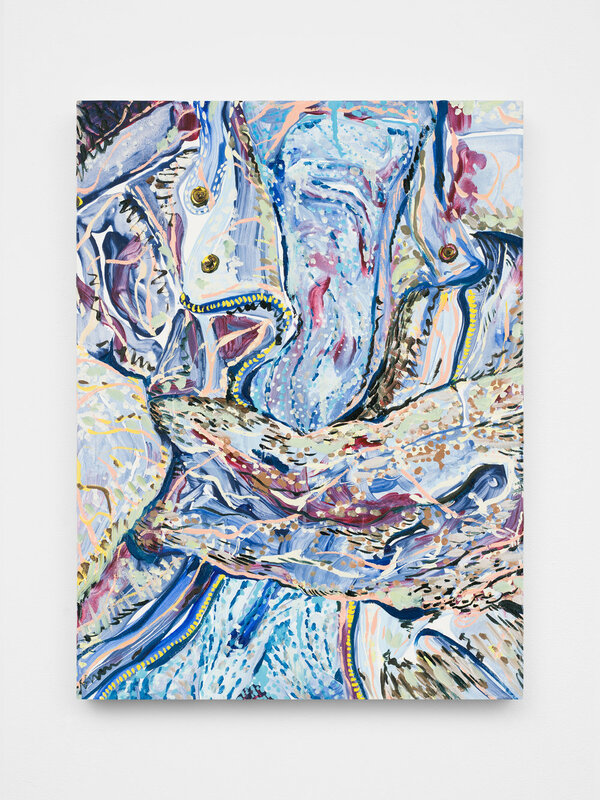 Siegel’s work was the subject of a two-person exhibition with Matthew Stone, Smile in The Dark, at Left Field Gallery, San Luis Obispo, California in 2016 and a solo exhibition, S.L.A.B., at Violet’s Café, Brooklyn in 2015. He has participated in a number of group exhibitions including The Gift Shop, Red Bull Studios, New York (2016); The landscape changes 30 times, Anahita Gallery, Tehran, Iran; Inside/Outside: Works from the Skowhegan Archivces, CSA Gallery, Waterville, Maine (both 2015); To do as one would, David Zwirner, New York (2014); and Getting It, Fowler Arts, Brooklyn (2013); among others. Later this year, he will be curating a group exhibition at Left Field Gallery, San Luis Obispo, California featuring work by Meena Hasan. 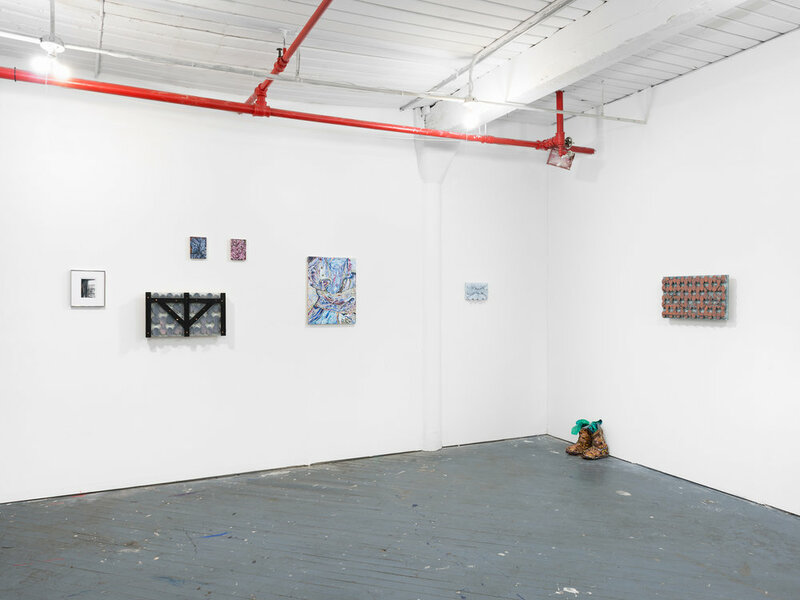 Later this year, both Hasan and Siegel’s work will be included in a group show Fun Junction at Austin Lee’s studio in Long Island City.